Objective: Primary thyroid lymphoma (PTL) is a rare entity, necessitating accurate and early diagnosis, as its management is very different from that of other neoplasms intrinsic to the thyroid. Materials and Methods: Cases diagnosed between January 2009 and March 2015 were retrieved, and clinical details were noted. Hematoxylin- and eosin-stained slides were reviewed. Immunohistochemistry (IHC) was performed for immunophenotyping, and cases were classified according to the World Health Organization 2017 classification of hematolymphoid neoplasms. Results: Eleven patients with PTL were identified, with a mean age of 64.6 years (range: 40–76 years), including three males and eight females. Duration of symptoms ranged from 2 to 36 months (mean: 9.3 months). Diffuse large B-cell lymphoma (DLBCL) was most frequent, followed by extranodal marginal zone lymphoma. Most DLBCLs were nongerminal center type. BCL2 was positive in all DLBCLs. Strong p53 immunopositivity was not seen in any of the cases analyzed. Conclusion: Histopathological evaluation supplemented by IHC is the gold standard for the diagnosis of PTL. Combined chemoradiotherapy appears to be the best treatment modality, irrespective of histological type. MIB-1 and MUM1 IHC may have a role in identifying DLBCL, particularly in small biopsies. Role of p53 and BCL2 needs further evaluation. Primary thyroid lymphoma (PTL) refers to a lymphoma which involves the thyroid gland with or without involving regional neck lymph nodes but without contiguous spread or distant metastases from other areas of involvement at the time of diagnosis. Although a rare entity, it is imperative that PTL is diagnosed early, as its management is very different from that of other neoplasms intrinsic to the thyroid gland. There is a paucity of literature on PTL from India till date, with majority of that available being single case reports.,,,,,,,, We report a series of PTL cases diagnosed at our institute, with their clinicopathological features, to contribute to the knowledge available on this neoplasm in order to enhance patient diagnosis and management. All cases diagnosed as PTL on core-needle biopsy as well as thyroidectomy specimens between January 2009 and March 2015 were retrieved from the records of the Pathology Department, All India Institute of Medical Sciences, New Delhi. Permission to conduct the study was obtained from the Institutional Ethics Committee. Clinical details of the patients were noted. Hematoxylin and eosin-stained slides were reviewed independently by two pathologists for confirmation of diagnosis. Immunohistochemistry (IHC) was performed for immunophenotyping, using the following antibodies: CD3, CD20, CD5, CD23, CD10, cyclin-D1, BCL2, BCL6, MUM1, CD43, MIB-1, and p53. Cases were considered positive for CD10, BCL6, and MUM1 if ≥30% of tumor cells were stained positively. MIB-1 labeling index (LI) was calculated. p53 immunopositivity was scored as weak, moderate, or strong, and the percentage of cells that were positive was assessed. All cases were classified according to the World Health Organization classification of tumors of hematopoietic and lymphoid tissues (2017). Corresponding bone marrow biopsies were evaluated for involvement by lymphoma. Treatment details and follow-up were obtained, where available. Eleven cases of PTL were identified over the study period. During this period, 3688 patients were enrolled in the lymphoma clinic, of which 2863 had a histologically confirmed diagnosis of non-Hodgkin lymphoma (NHL). Thus, PTL accounted for 0.4% of all lymphomas diagnosed during the study period. Patients ranged in age from 40 to 76 years, with a mean age of 64.6 years. There were three males and eight females. All patients (100%) presented with a mass in front of the neck; dysphagia was the next most common symptom (27.3%). Duration of symptoms ranged from 2 to 36 months, with a mean of 9.3 months. Eight patients were fully staged, of which four were Stage IE, three were Stage IIE, and one was Stage IVE. Clinical features of the patients included are summarized in [Table 1], and radiology is shown in [Figure 1]. Fine-needle aspiration cytology (FNAC) had been performed before histopathological evaluation in three cases. One of these (Case 7) had been reported as a poorly differentiated malignant tumor, possibly small-cell carcinoma or NHL – Bethesda Category VI, to be confirmed on histopathology [Figure 2]. The second (Case 9) was reported as suspicious for anaplastic carcinoma thyroid (Bethesda Category V). Case 11 had undergone FNAC thrice during the course of the disease and was reported as thyroiditis (Bethesda Category II) on two occasions, while on the third, the possibility of lymphoma was suspected (Bethesda Category V), prompting histological examination. While eight patients had undergone a Tru-cut biopsy from the neck masses, partial thyroidectomy (Case 6), total thyroidectomy (Case 9), and open biopsy (Case 11) had been performed in one patient each. One patient had cervical lymphadenopathy at presentation, and a lymph node biopsy was also performed (Case 3). On microscopic examination [Figure 3], diffuse large B-cell lymphoma (DLBCL) (70%) was more frequent than extranodal marginal zone lymphoma (EMZL) (30%). DLBCLs were composed of sheets of atypical lymphoid cells with scant cytoplasm, large vesicular nuclei, and prominent nucleoli. Mitoses including atypical forms, necrosis, and apoptosis were frequent. Three of the seven DLBCL cases (42.9%) showed the presence of accompanying EMZL. Immunophenotyping results for the DLBCL cases are described in [Table 2] and shown in [Figure 3]. All the DLBCL cases with available IHC results showed a nongerminal center B-cell (non-GCB) immunophenotype. IHC for BCL2, a marker of poor prognosis in DLBCL, was positive in all cases assessed. Results for p53 IHC were available in four cases, as the rest lacked sufficient tissue. Weak p53 immunopositivity was noted in three cases, in ≤10% of tumor cells only. Cases of EMZL comprised small-to-medium-sized cells with scant-to-moderate amount of cytoplasm, round-to-indented nuclei, dispersed chromatin, and inconspicuous nucleoli. There was focal lymphoid follicle formation. Few monocytoid cells were seen; however, plasmacytoid/plasma cells were absent. The results of IHC for EMZL cases are shown in [Table 2]. Cases 5, 6, and 9 displayed the presence of lymphoepithelial lesions; in the remaining cases, no residual thyroid follicles were identified, and hence, their presence could not be ascertained. In one case (Case 8), a diagnosis of NHL, B-cell immunophenotype, was rendered as further classification was not possible due to extensive crush artifact as well as the small size of the biopsy. The resection specimens, both diagnosed as DLBCL with accompanying EMZL, showed evidence of Hashimoto's thyroiditis in the adjacent uninvolved thyroid parenchyma [Figure 3]h. However, this feature could not be assessed in any of the biopsies. None of the corresponding bone marrow biopsies showed evidence of involvement by lymphoma. Treatment details were available for nine patients, as the remaining two patients (Cases 10 and 11) did not follow-up after diagnosis or receive any treatment at our institute [Table 3]. Combined modality treatment with induction chemotherapy followed by involved field radiation was used in early-stage disease, while chemotherapy was used for locally advanced disease (Stage III–IV). Out of seven patients with early disease, five received combined treatment with initial chemotherapy followed by radiotherapy (71.4%), while two patients (28.6%) received chemotherapy alone. The most common chemotherapy regimen was cyclophosphamide, adriamycin, vincristine, and prednisolone (CHOP) (44.4%), followed by rituximab with CHOP (R-CHOP) (33.3%), and mean number of cycles was 3.9. Of the five patients who received radiotherapy, 3 (60%) received three-dimensional conformal radiotherapy, while one each received intensity-modulated radiotherapy and two-dimensional radiotherapy. Follow-up period ranged from 2 to 50 months (median: 7.5 months). At last follow-up, five patients had achieved complete response (55.5%), while one had progressive disease (11.1%) and one was lost to follow-up after 5 cycles of chemotherapy. Of the two patients with early-stage disease who were treated with chemotherapy alone, one patient expired due to hyponatremia and aspiration, while one had Eastern Cooperative Oncology Group performance status III and was deemed unsuitable for further treatment; therefore, radiotherapy was not given. Interestingly, all three patients with poor outcome had received CHOP/cyclophosphamide, vincristine, and prednisone (CVP) and not R-CHOP. Comparing the outcome with respect to the grade of lymphoma, three of the five DLBCL patients with follow-up (60%) had a good clinical outcome in contrast to two (40%) with a poor outcome. Of the three low-grade lymphoma patients who could be followed up, two (66.7%) had a good outcome, while one (33.3%) had a poor performance status. PTL is rare, accounting for 5% of all thyroid neoplasms,,,, and 1%–2% of extranodal lymphomas. These tumors usually present with a painless neck mass that rapidly increases in size. Other symptoms include dyspnea, dysphagia, and change in voice. The mean age at presentation is usually in the seventh decade of life, and a female predominance has been noted.,, The age at presentation for male patients is almost a decade earlier than for females. Most patients present with early-stage disease., We report the clinicopathological features of a series of 11 cases of PTL diagnosed over a 6-year period. The results of our study were similar to those reported previously in literature, with an incidence of 0.4% of all NHL, female predominance, mean age of 64.6 years, and most patients presenting with a rapidly enlarging neck mass and early-stage disease. The only exception in our series was that, at the time of diagnosis, males were not younger than females. Ultrasound is the initial diagnostic modality in investigation of thyroid masses. However, the diverse imaging characteristics of PTL make it difficult to distinguish from other thyroid disorders., A recent study has described positron emission tomography–computed tomography as a useful imaging technique for differentiating between PTL and chronic thyroiditis and has also suggested that it may be able to distinguish between DLBCL and EMZL. However, in spite of these recent advances, histopathological examination remains the gold standard for diagnosing PTL. FNAC is the foremost technique for pathological assessment and has a reported accuracy of 25%–90% for diagnosing PTL., Diagnostic accuracy of FNAC can be improved by performing the procedure under ultrasound guidance. Flow cytometry has also been shown to improve its sensitivity and specificity. However, sampling error can lead to false-negative results. Core biopsy thus has a greater diagnostic accuracy and the added benefit of ease of phenotyping by IHC using a panel of markers. In our series, FNAC had been performed before histopathological evaluation in three cases, none of which was conclusively diagnosed as lymphoma, while core biopsy was diagnostic in all but one case. Thus, even when aspiration yields sufficient material, it is often difficult to make a definitive diagnosis on FNAC, and a biopsy should be performed for a confirmatory diagnosis and for immunophenotyping. The classification of PTL conforms to the pathological classification of lymphomas. Most PTL are B-cell NHL, while Hodgkin lymphoma and T-cell NHL are extremely rare., Two main groups are identified: EMZL or mucosa-associated lymphoid tissue (MALT) lymphomas, which behave in an indolent manner, and DLBCL which are clinically more aggressive. In literature, DLBCL accounts for 50%–70% of all PTL, while EMZL is seen in 10%–30% of cases.,,,, EMZL may transform into DLBCL, and DLBCL cases with foci of low-grade lymphoma can be seen., The previously used term high-grade MALT-type lymphomas is not used any longer,, as these neoplasms display clinical behavior akin to DLBCL and therefore need to be managed as such. We identified three such cases of DLBCL which showed foci of EMZL. The role of immunohistochemical markers such as MIB-1, p53, and BCL2 has not been evaluated in cases of PTL. We found that mean MIB-1 LI was higher in DLBCL cases without accompanying EMZL as compared to those with focal EMZL areas. However, it did not achieve statistical significance, which may possibly be attributed to the small number of cases in our study. Nevertheless, MIB-1 LI may be a useful adjunct in diagnosing high-grade thyroid lymphoma, especially in cases with a predominant low-grade component. This is of particular importance in the small Tru-cut biopsies commonly used for evaluation of these patients. While MUM1 immunopositivity has been associated with poor outcome in nodal DLBCL, its value in PTL has not been well documented. As expected, all of our DLBCL cases examined showed a non-GCB immunophenotype, as displayed by MUM1 immunopositivity. These findings suggest that high MIB-1 LI and MUM1 positivity may favor a diagnosis of DLBCL and may serve as adjuncts to histomorphology, particularly in core biopsies with small amount of tissue. Although a marker of poor prognosis in DLBCL, no conclusive impact of BCL2 could be identified in our PTL cases. Strong p53 immunopositivity was not seen in any of the cases either. The role of these two markers, therefore, needs further evaluation in a larger series of PTLs. Most cases of PTL (60%–90%) arise in a background of Hashimoto's thyroiditis, with chronic antigenic stimulation being proposed as the possible causative mechanism.,,, In the present study, all cases that included normal thyroid parenchyma showed features of Hashimoto's thyroiditis. The remainder was small biopsies which did not show any uninvolved thyroid tissue. Thus, the possibility of coexistent Hashimoto's thyroiditis cannot be completely excluded in these cases. There is no definite consensus on the optimal management of PTL. As PTL are considerably radiosensitive, radiotherapy is the cornerstone of therapy. When combined with chemotherapy, the risk of relapse is reduced. Surgery does not have much of a role to play in the management of PTL, except for palliative measures to relieve airway obstruction caused by the tumor. Thus, the gold standard in treatment of PTL at present is combination chemoradiotherapy. The most common chemotherapeutic regimens used are similar to nodal NHL, i.e., CVP, CHOP, and R-CHOP. In our series, CHOP was used most frequently, followed by R-CHOP. The overall survival rates with combination therapy are very good (>90%), and recurrence rates as low as 7.7% have been reported.,, Watanabe et al. showed that addition of rituximab to combination therapy was effective in patients with aggressive disease, with response rate of 98%. They also reported an improvement in overall survival following the addition of rituximab. We noted that most of the patients that received chemoradiotherapy (80%) achieved complete remission irrespective of the histological grade, while only one of those that received chemotherapy alone did so, suggesting that combination therapy has a better outcome. However, our study results are limited by the small cohort size. There was no significant difference in the clinical outcome of the patients with high-grade and low-grade lymphoma, with 60% of former and 67% of the latter achieving good clinical response. PTL is a rare neoplasm, accounting for 0.4% of all NHL, with DLBCL, non-GCB type being the most common histological type. It should be suspected in all patients that present with a rapidly enlarging neck mass, particularly females with Hashimoto's thyroiditis. While FNAC is the initial investigative modality, it may not always be diagnostic and histopathological evaluation supplemented by IHC remains the gold standard. IHC for MIB-1 may help in picking up small foci of high-grade transformation from low-grade lymphoma in Tru-cut thyroid biopsies. Combined chemoradiation therapy appears to be the best treatment modality, irrespective of the histological type. Although considered indolent, EMZL can transform into DLBCL, and these patients need to be kept on close follow-up to detect relapse at the earliest. Further multicentric studies on larger number of cases may be required to evaluate the prognostic significance of BCL2 and p53 in PTLs. Ansell SM, Grant CS, Habermann TM. Primary thyroid lymphoma. Semin Oncol 1999;26:316-23. Kumar R, Khosla D, Kumar N, Ghoshal S, Bera A, Das A, et al. Survival and failure outcomes in primary thyroid lymphomas: A single centre experience of combined modality approach. J Thyroid Res 2013;2013:269034. Gupta N, Nijhawan R, Srinivasan R, Rajwanshi A, Dutta P, Bhansaliy A, et al. Fine needle aspiration cytology of primary thyroid lymphoma: A report of ten cases. Cytojournal 2005;2:21. Verma D, Puri V, Agarwal S, Bhaskar A. Primary thyroid lymphoma: A rare disease. J Cytol 2014;31:218-20. Usha M, Kamath S, Sridhar M, Soman S. Primary thyroid lymphoma in the background of hashimoto thyroiditis. Clin Cancer Investig J 2015;4:362-4. Patnayak R, Choudhuri R, Samal D, Mahapatra D, Devi K, Pani C, et al. Primary thyroid lymphoma-an uncommon entity. J NTR Univ Health Sci 2017;6:140-1. Mondal SK. Cytodiagnosis of primary thyroid lymphoma with histologic correlation: A case report. Diagn Cytopathol 2012;40:444-6. Gill M, Batra A, Sangwaiya A, Shakya S, Gupta S, Sen R, et al. Small lymphocytic lymphoma of the thyroid mimicking plasmacytoma. Eur Thyroid J 2014;3:202-5. Naswa N, Sharma P, Nazar AH, Mohapatra TK, Bal C, Kumar R, et al. (18) F-FDG PET/CT for initial assessment and response monitoring in a case of high grade primary lymphoma of the thyroid gland: A case report and review of literature. Indian J Nucl Med 2014;29:94-6. 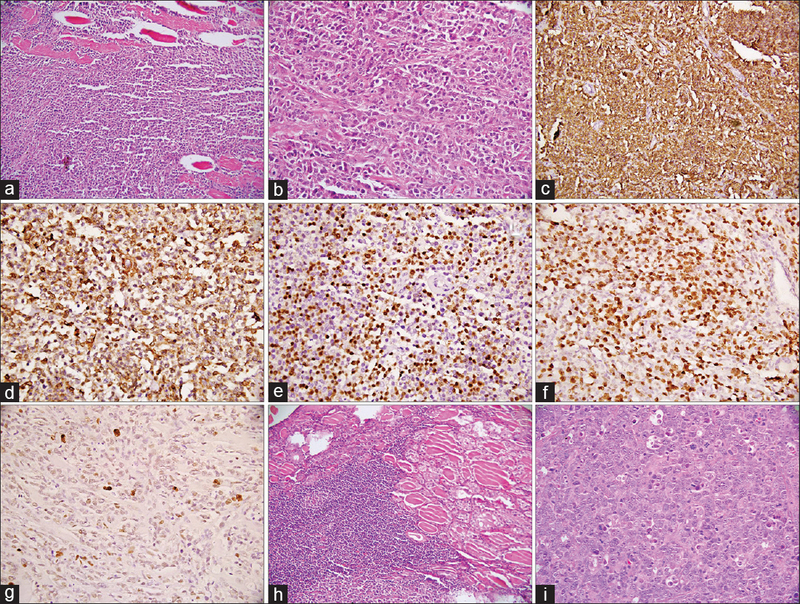 Mishra P, Banerjee D, Gujral S. T-cell lymphoma of thyroid gland with Lennert type of morphology: A case report and review of the literature. Head Neck Pathol 2016;10:321-6. Swerdlow SH, Campo E, Harris NL, Jaffe ES, Pileri SA, Stein H, et al., editors. WHO Classification of Tumours of Hematopoietic and Lymphoid Tissues. Lyon: IARC; 2017. Sakorafas GH, Kokkoris P, Farley DR. Primary thyroid lymphoma (correction of lympoma): Diagnostic and therapeutic dilemmas. Surg Oncol 2010;19:e124-9. Abbondanzo S, Aozasa K, Boerner S, Thompson LD. Primary lymphoma and plasmacytoma. In: De Lelis RA, Lloyd RV, Heitz PU, Eng C, editors. Pathology and Genetics of Tumours of Endocrine Organs. Lyon: IARC; 2004. Walsh S, Lowery AJ, Evoy D, McDermott EW, Prichard RS. Thyroid lymphoma: Recent advances in diagnosis and optimal management strategies. Oncologist 2013;18:994-1003. Stein SA, Wartofsky L. Primary thyroid lymphoma: A clinical review. J Clin Endocrinol Metab 2013;98:3131-8. Alzouebi M, Goepel JR, Horsman JM, Hancock BW. Primary thyroid lymphoma: The 40 year experience of a UK lymphoma treatment centre. Int J Oncol 2012;40:2075-80. Derringer GA, Thompson LD, Frommelt RA, Bijwaard KE, Heffess CS, Abbondanzo SL, et al. Malignant lymphoma of the thyroid gland: A clinicopathologic study of 108 cases. Am J Surg Pathol 2000;24:623-39. Graff-Baker A, Roman SA, Thomas DC, Udelsman R, Sosa JA. Prognosis of primary thyroid lymphoma: Demographic, clinical, and pathologic predictors of survival in 1,408 cases. Surgery 2009;146:1105-15. 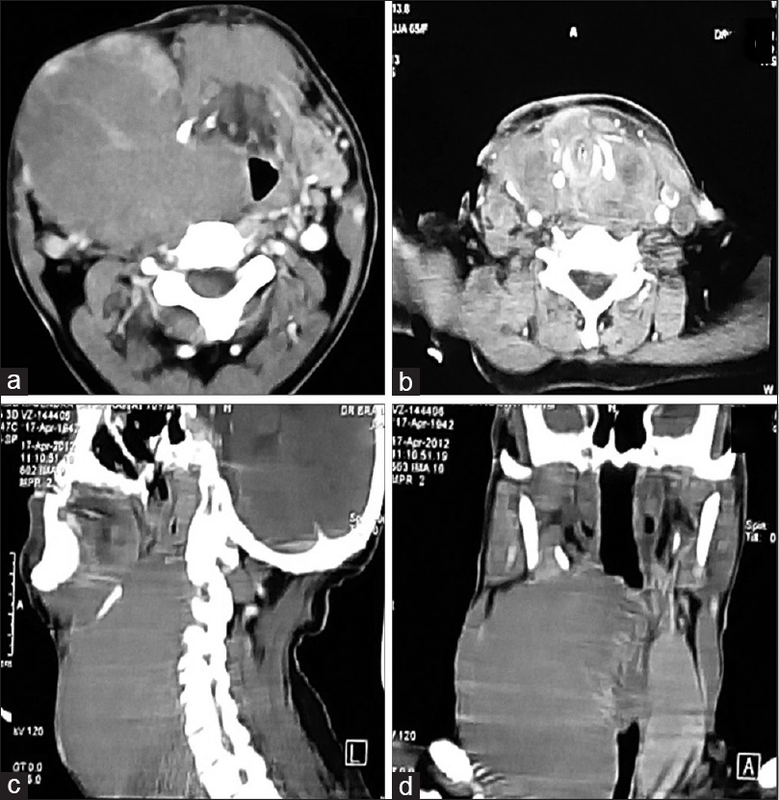 Wang JH, Chen L, Ren K. Identification of primary thyroid lymphoma with medical imaging: A case report and review of the literature. Oncol Lett 2014;8:2505-8. Nakadate M, Yoshida K, Ishii A, Koizumi M, Tochigi N, Suzuki Y, et al. Is 18F-FDG PET/CT useful for distinguishing between primary thyroid lymphoma and chronic thyroiditis? Clin Nucl Med 2013;38:709-14. Swart GJ, Wright C, Brundyn K, Mansvelt E, du Plessis M, ten Oever D, et al. Fine needle aspiration biopsy and flow cytometry in the diagnosis of lymphoma. Transfus Apher Sci 2007;37:71-9. Szczepanek-Parulska E, Szkudlarek M, Majewski P, Breborowicz J, Ruchala M. Thyroid nodule as a first manifestation of Hodgkin lymphoma-report of two cases and literature review. Diagn Pathol 2013;8:116. Chen C, Yang Y, Jin L, Dong L, Zhang X, Xiang Y, et al. Primary thyroid T-lymphoblastic lymphoma: A case report and review of the literature. Int J Clin Exp Pathol 2014;7:443-50. Thieblemont C, Mayer A, Dumontet C, Barbier Y, Callet-Bauchu E, Felman P, et al. Primary thyroid lymphoma is a heterogeneous disease. J Clin Endocrinol Metab 2002;87:105-11. Onal C, Li YX, Miller RC, Poortmans P, Constantinou N, Weber DC, et al. Treatment results and prognostic factors in primary thyroid lymphoma patients: A rare cancer network study. Ann Oncol 2011;22:156-64. Watanabe N, Narimatsu H, Noh JY, Kunii Y, Mukasa K, Matsumoto M, et al. Rituximab-including combined modality treatment for primary thyroid lymphoma: An effective regimen for elderly patients. Thyroid 2014;24:994-9. Skacel M, Ross CW, Hsi ED. A reassessment of primary thyroid lymphoma: High-grade MALT-type lymphoma as a distinct subtype of diffuse large B-cell lymphoma. Histopathology 2000;37:10-8. Pedersen RK, Pedersen NT. Primary non-Hodgkin's lymphoma of the thyroid gland: A population based study. Histopathology 1996;28:25-32. Watanabe N, Noh JY, Narimatsu H, Takeuchi K, Yamaguchi T, Kameyama K, et al. Clinicopathological features of 171 cases of primary thyroid lymphoma: A long-term study involving 24553 patients with Hashimoto's disease. Br J Haematol 2011;153:236-43. Kossev P, Livolsi V. Lymphoid lesions of the thyroid: Review in light of the revised European-American lymphoma classification and upcoming World Health Organization classification. Thyroid 1999;9:1273-80. Doria R, Jekel JF, Cooper DL. Thyroid lymphoma. The case for combined modality therapy. Cancer 1994;73:200-6. Matsuzuka F, Miyauchi A, Katayama S, Narabayashi I, Ikeda H, Kuma K, et al. Clinical aspects of primary thyroid lymphoma: Diagnosis and treatment based on our experience of 119 cases. Thyroid 1993;3:93-9.